1) Boil water with sugar and corn syrup. 2) Set aside and let cool down. 3) Add juice, puree and the eau de vie. 2) Whisk together yolk and sugar over steam. 4) Whip up cream to soft tips. 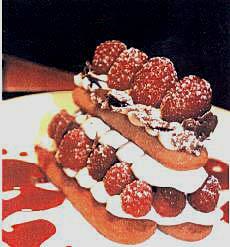 3) Place 2 rows raspberries into cream. raspberries on top of the first layer. 5) Dust with a dash of powdered sugar.